There are few composers from that era whose symphonies persist in the current repertoire: Berlioz, Mendelssohn, Schubert (arguably, he is actually a contemporary of Beethoven), Schumann. They all did so by following the above recipe. 1810: Born in Zwikau, Saxony, Germany. Father bookseller and novelist. Displayed early interest in music, age seven. 1826: Lost his father, at age 16. Mother encouraged him to go to law school. 1828: Bouts of “melancholy.” Periodically recurred in years to come. 1830: Began studying piano with Friedrich Wieck, in Leipzig. 1841- 1854: orchestral and chamber works, four symphonies, a piano concerto. 1831: Papillions. free form piano music inspired by a Jean Paul novel. 1834: Began career as an influential music critic with the magazine, Die Neue Zeitschrift für Musik (“New Journal for Music”). 1834: Engagement to Ernestine von Fricken, The ill-fated relationship ended in 1835. 1835: Met Felix Mendelssohn at Wieck’s house. 1835: In love with Clara Wieck, a piano prodigy and his teacher’s 15 year old daughter. She is destined to become “the most outstanding woman pianist of the nineteenth century” (Ostwald). 1835: Carnaval, free form piano piece inspired by Ernestine von Fricken. 1837: Marriage proposal to Clara Wieck. Resulted in lawsuit by her father who opposed the union. 1838: Discovered Franz Schubert’s then unknown Symphony #9. Premiered by Mendelssohn in Leipzig in 1839. 1840: Lawsuit resolved. Robert and Clara marry. They were to have eight children. 1841: Premieres of Symphonies #1 and 4. 1842: First major mental breakdown. 1844: More severe mental breakdown. 1845: Gradual improvement of mental health; begins intense study of counterpoint and the music of J. S. Bach. 1845: December; completed first draft of Symphony #2. 1846: November 5; Symphony #2 premiered by Felix Mendelssohn at Leipzig Gewandhaus. 1853: Discovered Johannes Brahms, then 20 years old. 1854: Suicide attempt, jumped off a bridge into the Rhine River. Confined to an insane asylum in Bonn from thereon. Separated from Clara and his children until his death. NOTE: Schumann’s mental problems have been attributed to different conditions by different historians: bipolar disorder, dementia praecox (schizophrenia), syphilis. 1856: Died at age 46. 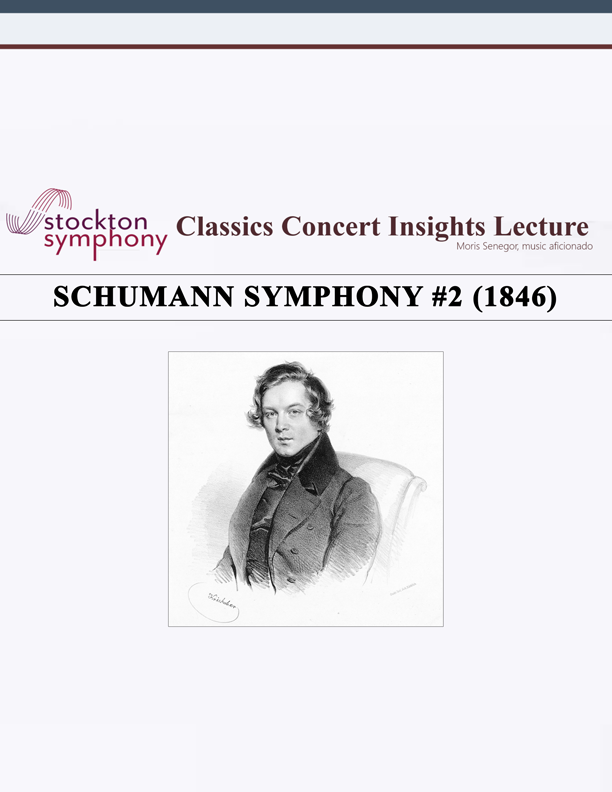 In his symphonies Schumann displays a typically Germanic tendency of tightly knit compositions with strong thematic unity. Schumann delighted in inserting ciphers and codes into his music. Schumann’s piano works and lieder (songs) are considered some of his best pieces. His orchestral works are controversial among scholars. Many conductors tinkered with Schumann’s orchestration. Gustav Mahler is the most famous example. Others disagree and claim that his orchestration reflects “a real sound image that he wanted to capture.” (Stephen Ledbetter). Composed in in December 1845 while recovering from a mental breakdown. In a letter to Mendelssohn, Schumann wrote that he was inspired in September 1845, after hearing drums and trumpets in C major. The first piano draft of the symphony was finished within three weeks in December 1845. First Movement completed December 12-17. Orchestration took much longer; completed in September 1846. The score is dedicated to King Oscar I of Sweden and Norway, a music lover. A second performance eleven days later, with a revised score, was better received. The symphony was admired by 19th century critics, but disparaged in the 20th century. The fourth movement has been particularly singled out for criticism (see Movement 4). Schumann’s orchestration has also been targeted for criticism. Schumann’s choice of tonality has also been criticized as simplistic (see below). Some criticize the symphony for diverging from the Classical style. Others don’t. Many liken the symphony to Beethoven’s Fifth Symphony (1808) in their common dark to light narrative. Others disagree, indicating that Schumann’s narrative is not as straightforward as Beethoven’s. The positions of the Scherzo and slow movement are reversed. There is precedent for this in Beethoven (9th Symphony). All movements are in the tonality of C. This is an unusual key structure, one without precedent in symphonic music. Slow and stately introduction begins quietly (pp), with two melodies that will provide the motives for the remainder of the symphony. Atop is a rising fanfare melody (A1) on brass (two trumpets, a horn and trombone). This is accompanied by a busier string melody (A2) that begins with a chromatic descent; it then rises, outlining a C major triad. The brass fanfare extended, strings still in accompaniment. NOTE: The brass A1 theme strongly resembles that in the introduction of Haydn’s Symphony 104 (1795). Some interpret the fanfare (A1) and its string accompaniment (A2) to represent the two opposing moods of the composer or, when extrapolated, lightness and darkness in life. The orchestration of this important passage is tricky. Schumann intended the two melodies to hold equal balance, but in a pp passage, brass can easily overpower strings. Depending upon different conductors, the passage can make different impressions if this balance is lost. Gustav Mahler, aware of this issue, re-orchestrated this symphony and reduced the brass part, eliminating the trombone, using two trumpets only and horns in accompaniment, playing a softly sustained “C”. Texture of chorale thickens with the A1 brass fanfare and A2 string accompaniment re-entering in a small crescendo. Diminuendo on the string melody line. In a passage marked un poco più vivace (a little more lively) a brief crescendo in winds followed by a new motive with a dotted rhythm, derived from A1. This new motive emerges as a foreshadowing of Theme I of the Allegro. It is repeatedly stated in winds alternating with loud orchestral chords. Volume rises to its loudest so far, in a crescendo that’s joined by brass. Loud introductory gesture with pauses leads to the expectation that the Allegro is about to begin. It doesn’t. NOTE: This dramatic but peculiar introductory gesture and the new material that follows in Part 4, foreshadow an important moment in the fourth movement where a similar introductory gesture will usher in the An Die Ferne Gelibte melody from Beethoven. A new melody, derived from A1 stated three times in cellos and violins, each statement emphasized by orchestral chords. Transitional music in strings picks up tempo in a più stringendo passage (accelerating) as the introduction leads to the Allegro. This long Introduction constitutes one third of the movement. Overall, the Introduction resembles J. S. Bach’s chorale preludes, an homage to Bach whom Schumann studied prior to composing this symphony. The Introduction serves the important function of introducing the two ur themes, A1 & A2, to be utilized in the rest of the symphony. The overall gloomy mood of the Introduction represents Schumann’s emotional state during his mental breakdown. The Fourth Movement finale will feature recollections of the Introduction, now loud, and glorious, completing the narrative arc from despair to healing and redemption. The Exposition is brief in contrast to the other parts of the movement. A simple two note motive with a dotted rhythm, obsessively repeated. It is derived from the rising short-long, two note idea within the A1fanfare. It begins quietly and builds louder. Modulating Bridge: Brief, fast passage. Theme I motive alternates with a rising scale derived from A2. A rising scale motive, sequenced (repeated in different pitches). It’s based on a rising motive within the A2 string theme of the Introduction. Closing Theme (G major) derived from a motive of the Modulating Bridge. Exposition concludes with a loud passage derived from Theme I. In accordance with Classical Era procedure, Exposition is repeated verbatim. Begins quietly with a slower version of the Modulating Bridge. Extends with a louder passage developing the rising scale derived from A2. Part 2: Theme II motive developed in a brief passage. Winds develop a three note falling motive derived from the tail end of A1. It is periodically accompanied in bass by the rising scale of A2 from the Modulating Bridge. Melody extended in a rising passage marked molto espressivo. NOTE: Leonard Bernstein calls this a new theme. Others don’t. The entire passage is varied with slightly different orchestration. NOTE: This section occupies a significant portion of the development. Loud agitated section begins with the two-note Theme I motive. Modulating Bridge motive developed in a dramatic, rhythmic, Beethoven-like passage. Concludes with a false recapitulation of Theme I. The theme begins and is cut short, ending in an open cadence. Transitional melody from the end of the Introduction (Part 4) is elaborated and developed. The music rises in a slow crescendo. This passage is over a G pedal in bassoons. Two loud string tremolos, each answered by winds, usher in a crescendo into a loud, celebratory recap of Theme I. Theme I recapped louder and more celebratory than its initial version. Bridge is longer, louder and more elaborate than its earlier version. Theme II repeated in C major. Closing Section mirrors its Exposition version. Essentially a second development section, Beethoven-like. Begins quietly with a variation of Part 4 of the Introduction. Music rises on the Theme I motive. From here on Schumann instructs, con fuoco, with great vigor and speed. The remainder of the coda will be loud, animated and energetic, developing Theme I and Theme II motives. A series of triumphant climaxes, based on the Closing Section. Atop the loud music, “trumpets and horns blaze out the opening (fanfare) theme.” (Brian Schlotel). The opening A1 fanfare is stated twice, with trombones instructed to play marcato, louder than everyone else. Music calms down on Theme I motive. It is then extended in an increasingly loud passage toward another climax. Loud concluding chords are emphatically repeated in a triumphant finale that is likely to draw premature applause from the audience. Many scholars have commented that this joyous Coda seems premature in the overall “despair to redemption” narrative of the symphony. The triumph of the Coda foreshadows the finale of Movement 4. Overall Movement 1is firmly anchored in the Classical Era model. It extends the usual A – B – A structure to A – B – A – C – A. This was preceded by Beethoven in his 4th and 7th Symphonies. It is in duple meter rather than the expected triple meter. It presents two different Trios. This feature was unique. A lively, energetic, virtuosic theme in violins with string and wind accompaniment. This theme, derived from the A2 string melody of the Introduction, is a faster version of a motive within this theme. The first phrase a is a brief four-square melody that presents the theme. It is repeated. Next phrase a’ is longer. It begins with the theme in strings conversing with winds. It is then extended. A brief counter melody follows. Finally the theme is re-stated in a forte passage. a’ is repeated. The third phrase a’’ is a shorter variation of a’ featuring the same sequence of string/wind conversation, counter melody and re-statement of the theme in a heavily syncopated variation. NOTE: The repetitions of a and a’ serve the purpose of familiarizing the listener with the theme. In the next two iterations of the Scherzo, these phrases will NOT be repeated. A quiet, more leisurely section in sharp contrast with the breathless momentum of the Scherzo. Phrase structure: a – a – b – a .
a: Trio theme features a wind melody, derived from opening A1 fanfare of the Introduction, conversing with a string melody derived from the A2 string theme of the Introduction. Strings melody extended. b: Wind theme motive repeated twice, in ritard. Fanfare in winds derived from the Trio theme. The ritard passage of b provides transition back to Scherzo. a – a’ – a’’ repeated verbatim. After the unhurried Trio the music re-acquires energy. In this section Schumann, prone to encoding cyphers into his music, presents one. It is a tribute to J.S. Bach. Phrase b, B-flat – A – C – B-natural, spells out BACH in German. a: A string chorale, quiet and peaceful. a’: Chorale melody in winds, slightly louder (mf), with staccato viola accompaniment. b: Brief, soft (p) passage in low strings, a variation of the main theme motive. a’’: Main theme returns. Music rises to a climax with tympani beats. Transitional music: Phrase a motives lead to Scherzo motives stated with pauses. Scherzo theme motive picks up yet more momentum and races to the finale. The texture of the music is thicker, with winds, brass and strings all participating. The A1 fanfare of the Introduction is recalled fortissimo, by horns, trumpets and trombone, before the loud and boisterous conclusion. NOTE: This important passage is easy to miss amid the massive sound and fast tempo of the finale. Some scholars have interpreted this movement as Sonata Form. For the listener however, a ternary structure is easier to follow. The sections are not even. B, a fugato, is very brief compared to the A’s. The two A sections have the same phrase structure. However their music is not identical. Each phrase of A’ is a variation of its counterpart in A. Phrase structure: a – b – a’ – a’’. The theme is an achingly beautiful melody, marked cantabile in the score. It unfolds leisurely over nineteen measures. NOTE: This theme is derived from the A1 fanfare of the Introduction. It bears resemblance to the opening theme of the trio Sonata in J.S. Bach’s Musical Offerings (another homage to Bach). NOTE: This theme will return in Movement 4 as a Theme II. NOTE: The oboe is the female voice in the woodwind section, the bassoon the male. Codetta: Music swells as the last phrase of the melody goes back to the strings and ends diminuendo, in a closed cadence. Begins with a solemn brass and wind chorale, the melody derived from the A1 fanfare of the Introduction. Strings respond with a melody derived from the A2 string theme of the Introduction. Woodwind codetta on the last phrase of the string melody. Main theme returns “almost clandestinely,” (Peter A Brown), in the flute and oboe. This variation is developmental, on the main motive of the melody. A brief string chorale transitions out of a’. Music rises in preparation of the return of the main theme. The theme returns in a loud, agitated passage on strings, the passage ending in loud violin trills. NOTE: This high violin passage has attracted the attention of critics and scholars. For the premiere, “This notorious passage was rehearsed repeatedly by Mendelssohn and Ferdinand David (concertmaster) with the Gewandhaus Orchestra” (Peter A Brown). Woodwinds take up the theme as the string trills diminish, and end the section on a diminuendo codetta. NOTE: The difference between trill and tremolo: Trill is an ornamental fluctuation between two notes, usually a half or whole step apart. Tremolo is playing the same note quickly back and forth. The fugue subject is a rhythmically altered , staccato version of the main theme. It is initially in second violins. First violins enter after one measure, with clarinet providing a pp legato accompaniment. Violas join in and, after four measures, the bases enter. At the entry of the bases the music rises in a crescendo. After two measures, the music, now a loud four-part fugue, becomes an accompaniment to the A’ section. The fugue will disappear at the end of the first phrase ( a) of this section. Phrase structure remains the same: a – b – a’ – a’’. Key areas are different (see below). With the fugue still in progress, the wind section loudly states the beautiful theme in a passage marked espressivo. NOTE: Compared to its first presentation, this a section is truncated. It ends after eight measures (versus nineteen); it lacks the oboe/bassoon passage; it lacks a codetta. It is also re-orchestrated, the main theme in winds rather than strings. The truncation, fugal accompaniment and re-orchestration of a, makes it a variation of its original version. Yet, it will sound to the listener as the same, because the unaltered main melody produces the same emotional impact. Music modulates to C major. From here on it will stay in this key. This is also a truncated, re-orchestrated variation of b. It lacks the horn/wind chorale that ushered the earlier version of b. The section begins with the string melody of the earlier b. It follows the same phrasing of the melody, shared by strings and winds. Theme in different wind instruments, clarinet, then oboe, then bassoon with a quiet, hesitant string accompaniment. It is no longer developmental as in its earlier version. It is considerably truncated. The phrase structure of this section is the same as its earlier version. The key area and orchestration are different. The quiet chorale that initiates the section is in winds. Violins then follow with their loud, impassioned version of the theme, ending in trills in their highest range. Woodwinds begin their codetta over the violin trills and take the section to a diminuendo ending as in the earlier version. Theme motive recalled quietly in violins, then bases. Music fades away with theme fragments in strings. Movement ends with a double amen (plagal) cadence. Schumann placed the Adagio as the third movement, instead of the traditional second, most likely for the expressive purpose of juxtaposing its melancholy against the triumph of the fourth. This movement has been much criticized, mainly because of its confounding structure. Numerous scholars have interpreted the movement by force-fitting it into known Classical Era forms: Sonata Form variant with a giant Coda; Rondo variant. These academic exercises are not useful to the listener. Part I is a Sonata Form exposition and development that cuts off without a recap or coda. Part II (what many call a Coda) is pair of developments on a common, new theme. The movement is approximately bisected to two halves by each part. Begins with an introductory gesture, an orchestral chord, forte, followed by a rising scale and four chords in winds and strings. The abrupt change in mood from melancholy at the end Movement 3 to this livelier music has been criticized as a rough juxtaposition of mood. Theme I complex (C major) spans some forty measures, loud and with momentum. The theme is a lively, march-like idea initially in woodwinds, then in full orchestra. NOTE: This theme is reminiscent of the first theme in Mendelssohn’s Italian Symphony. Phrasing of the theme: a – a’ – a’’ – b – b’ – b’’. a’’ & b’’ present extensions of their respective ideas. Modulating Bridge is a series of rising-falling scales in strings with winds arpeggios providing ornamentation. Music is more quiet and thinner in texture. Theme II (G major) is the Adagio theme, presented twice by horns over continuing scales in the strings. Horns present the theme as an antecedent and strings respond with a counter melody. Theme II extended, using its motivic fragments, in a passage with forward momentum. Brief Closing Section features vigorous, forte, rising-falling scales in strings and low winds accented by chords in brass and high winds. There is no closing theme. Begins with a repetition of Theme I, now in its loudest, most triumphant version, in full orchestra. NOTE: Some scholars view this as Recapitulation telescoped into Development within what they envision as a full Sonata Form structure. Opening gesture returns twice, this time the rising scales each followed by six chords (instead of four). It ushers in a vigorous development. Two note motives of Theme I developed in a fast, loud passage. Momentum continues with developments based on the arpeggio of the introductory gesture, and a falling three note idea based on an Adagio motive. Music rises to a climax on a rising three note idea. Theme II developed in a quieter, dolce passage, beginning in woodwinds, extended by strings. Music fizzles in a diminuendo passage that ends in pauses and quiet plagal (amen) cadences in the key of C minor. A lengthy, three measure general pause gives the listener an impression that the movement is over. NOTE: In the “redemption” narrative of the symphony this is the point where emotional suffering, signified by C minor, comes to an end. From here on the music will build up to a lively and triumphant finale in C major. A pretty melody derived from the opening flourish of the movement (rising tail of the flourish rhythmically smoothened). It is introduced dolce by the oboe. Strings answer with a counter-melody. The oboe melody is repeated as a wind chorale. Begins with a rising three note idea with a dotted rhythm, based on the theme. It is stated forte in a syncopated passage. Theme repeated, first in strings, then in winds, and extended. Music rises on a four note rising motive based on the theme. Loud climax on a variation of the theme with rushing scales, drumrolls and syncopated orchestral accents. Music rushes toward a massive open cadence and a dramatic leading gesture followed by a pause. Something important is about to happen. Strings & winds play a quiet new version of the theme. Phrase structure: a – a’ – b – b’. Winds echo b & b’. NOTE: Phrase a & a’ appeared in Part 4 of Movement 1 Introduction. NOTE: Main motive of Phrase b is derived from the A1 fanfare of the Introduction. It appeared in the transitional music that led to the Exposition. Schumann had used this very same melody in his Piano Fantasy (1836) when he was forcefully separated from her by Clara’s father. Now however, they were together. Schumann’s invocation of a Distant Beloved in reference to his wife is viewed as his sense that they are still separated, perhaps spiritually by his mental illness. It is certainly a premonition of the tragic events to come when Schumann was forcefully separated from her in an insane asylum for the last two years of his life. Phrases a & a’ stated twice, quietly by violins. Ends with a brief brass flourish. The theme telescoped in a louder variation. Phrases a & a’ in strings receive an abbreviated b response in crescendo brass. INTRO WIND CHORALE RECALLED: The wind chorale of the First Movement Introduction stated loudly in winds; receives a fortissimo response in brass based on b & b’ of the theme. INTRO A1 FANFARE RECALLED: The theme re-stated in a loud, glorious variation in strings with tympani beats. The A1 fanfare of the Introduction blares out fortissimo in two brass proclamations over the theme. INTRO PART 3 RECALLED: Loud passage in full orchestra on a rising two-note idea with a dotted rhythm. This recalls its predecessor in Part 3 of the Introduction, the un poco più vivace passage. NOTE: Intro Part 3 was derived from the A1 fanfare & gave rise to Theme I of the Allegro. All this is now linked to the finale. CODETTA: Presents a brief, loud gesture, juxtaposing the new theme with the Intro & Allegro: the beginning of the new theme (strings) receives a ceremonial two-note dotted rhythm response (brass with tympani beats). Gesture repeated. Open cadence. NOTE: These loud and celebratory recollections of the Introduction complete the narrative arc of the journey from despair to healing and redemption. The music catches its breath as dynamics fall to piano. It then rushes on in a dramatic crescendo that sequences the rising four note motive of the theme. Intro Part 3 recollection repeated and extended, fortissimo, with brass at full blast. Glorious, march-like. Celebratory concluding chords amid loud tympani beats. Haydn Symphony 104: Movement 1 Introduction, A1 brass fanfare. J S Bach Chorale Preludes: Movement 1 Introduction. J S Bach, in name: Movement 2, Second Trio. J. S. Bach Musical Offerings, Trio Sonata; Movement 3, main theme. Mendelssohn, Italian Symphony: Movement 4, Theme 1. Beethoven, An Die Ferne Geliebte Song Cycle: Movement 4. Composed in 1816, it is an early precursor of Germanic song cycles. The music is for a tenor and solo piano. It is set to a series of six poems written by Alois Isidor Jeitteles. They all have the theme of unrequited love. Beethoven may have been attracted to the Distant Beloved of these songs due to the Immortal Beloved episode in his own life. He decides to sing songs conveying his love, while atop a hillside looking at the spot where he first met her. He sends his angst and inner pain to the landscape he is observing; that way he can always be with her, even though he cannot go to her. He bids the clouds, the brook, the birds and the west wind to carry his love and suffering to her. He is enraptured with the thought of these elements seeing her; her picture flowing back to him via the brook. In lovely May, with spring and nature in full bloom, it is their love that remains in winter and all they have is tears. He will send her the songs he has written, and she will sing them, these songs vanquishing what has kept them apart, joining them together. Zu der Laute süßem Klang. To the sweet sounds of the lute! When taken within the context of Robert and Clara’s relationship the song acquires a special meaning.